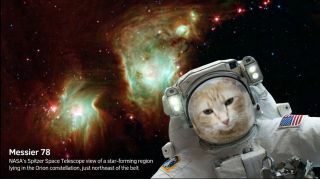 A new app from NASA lets users share selfies in front of dazzling cosmic landscapes as imaged by the Spitzer Space Telescope. New virtual reality apps from NASA let users take space selfies and visit a cool star system that has seven Earth-size exoplanets. The two apps were made public yesterday (Aug. 22) to celebrate the 15th anniversary of the launch of NASA's Spitzer Space Telescope. That instrument's infrared images feature in both of the new programs. The NASA Selfies app, available at this link for iOS and Android, lets viewers take selfies in front of picturesque space locations. Examples include the center of the Milky Way galaxy (Earth's home galaxy) and the Orion Nebula, a famous star-birth region located about 1,350 light-years from Earth. "The app also provides information about the science behind these stunning images. There are currently 30 eye-catching images to choose from, all taken by Spitzer," officials from NASA's Jet Propulsion Laboratory said in a statement. "More images from the agency's other science and human spaceflight missions will be added in the future." If planetary exploration is more your space style, NASA has a VR app for you. The NASA Exoplanet Excursions VR app shows off TRAPPIST-1, where seven Earth-size planets were confirmed in 2017. It's unclear how habitable those planets are (some of their surfaces may be too wet for life), but the find is still intriguing for astronomers, because the planets are just 39 light-years away. This makes them easier to study in a telescope, because they are relatively close to us. "Spitzer played a major role in detecting these planets and providing information that has helped scientists learn about the planets' likely compositions," NASA officials said. "The TRAPPIST-1 system is too far away for telescopes to directly observe these planets, but this VR experience features artists' impressions of what the planets might look like. These impressions are based on data from Spitzer and other telescopes that have studied the TRAPPIST-1 system." The VR app is available on the Spitzer website for both Oculus and Vive. The Spitzer YouTube page also has a video about TRAPPIST-1 that can be viewed on a desktop or a smartphone; you can also use a smartphone with a 360-degree viewer, such as Google Cardboard.